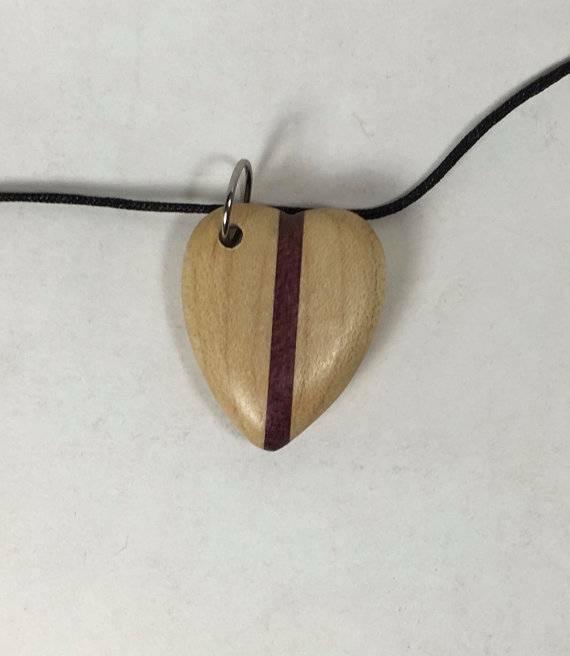 This simple yet striking heart pendant is cut from a combination of Maple and Purpleheart woods. The finish is a thin, oil based polyurethane which protects the wood. "For the majority of my adult life, I've earned my living performing, writing, recording and teaching music. Though my music career served as my primary creative outlet, I've found myself experimenting with numerous other art forms. 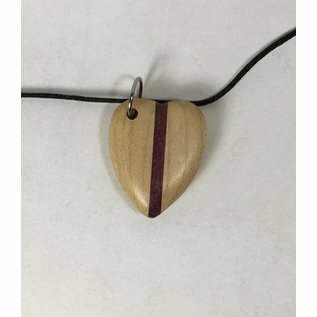 Working with wood has long been a passion of mine as have painting and drawing. As time progressed, so too did my skill sets. Though my focus was spread over many media and techniques, eventually my ability began to match my enthusiasm providing me with the confidence to build these hobbies into a second career. While music still holds a significant place in my life, I'm drawn, more and more, to my other artistic avenues. The result is a trade in values as what was a second career has taken over as my primary focus."